(3) manager of administrative issues (benefits, purchasing, and billing). The tasks involved in those additional jobs can sometimes be so time-consuming they interfere with other important responsibilities (like going to work). Some tasks may be beyond the patient’s capability and so don’t get done right – or done at all. The POINT here is that Burden of Treatment is a significant but under-acknowledged and thus unmanaged issue. Anyone “in the business” for a while has had a vague sense that this is a practical concern with major impact. But to date we’ve just been haphazardly addressing it. All stakeholders in health-related work disruptions do need to stay alert to how much time and effort patients/claimants/employees are spending on treatment and care regimens of various kinds (and their attendant administrative/financial issues). We also need to assess how well they are managing that burden. Once we DO start to pay more attention to this issue and see how the impact varies from one treatment regimen to another, we will see that we have an opportunity to work on REDUCING BoT. Figuring out how to systematically classify and document BoT is a necessary early step to increase awareness and opportunities for active management. There may well be a vast literature on this topic — but I am unaware of it. The particular study whose abstract appears below reminded me that this issues exists. It explores whether/how to use the terminology in the ICF to document BoT. (ICF is the International Classification of Function, the lesser known companion to the ICD – International Classification of Disease.) And I don’t know whether the ICF addresses the burden of administrative issues. Do you? TAKEAWAY MESSAGE: Let’s all think more about what a high burden of treatment means for our patients/claimants/employees, and what we can do to reduce it. GONCALVES AV, Jacome CI, Demain SH, Hunt KJ, et al. 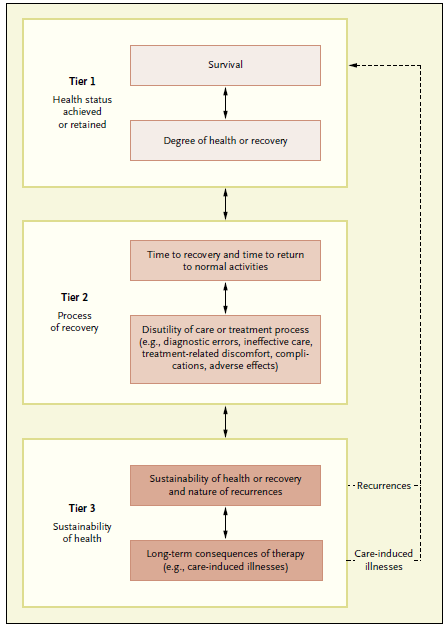 Burden of treatment in the light of the international classification of functioning, disability and health: a “best fit” framework synthesis. PURPOSE: This systematic literature review aimed to (1) summarize and explain the concept of Burden of Treatment (BoT) using the International Classification of Functioning, Disability and Health (ICF) terminology, and (2) inform the development of a future Comprehensive ICF Core Set for BoT. METHOD: Searches on EMbase, Medline, CINAHL and PsycINFO were conducted. Only qualitative studies were considered for inclusion. The screening and data extraction stages were followed by a “Best-fit” framework synthesis and content analysis, using the established ICF linking rules. Screening, data extraction, quality appraisal and data analysis were performed by two independent researchers. RESULTS: Seventeen studies were included in this review. The “Best-fit” framework synthesis generated 179 subthemes which identified that BoT impacts negatively on body functions and structures, restricts valued activities and participation and influences contextual factors through life roles, self-identify and relationships. The identified subthemes were linked to 77 ICF categories. CONCLUSIONS: This study is part of the preparatory phase of a Comprehensive ICF Core Set for BoT and our findings will inform the further needed studies on this phase. The use of ICF terminology to describe BoT provides an accessible route for understanding this complex concept, which is pivotal for rethinking clinical practice. Implications for rehabilitation Health professionals applying the ICF should consider the negative impact of interventions on patient’s life roles and self-identity, body functions and structures and on valued activities and participation. Health professionals who may be concerned about the treatment burden being experienced by their patients can now use the ICF terminology to discuss this with the multidisciplinary team. Poor adherence to rehabilitation programs may be explained by an increased BoT. This phenomenon can now be mapped to the ICF, and coded using a framework well known by multidisciplinary teams. This entry was posted in Articles, Publications, Research, Causes of Poor Outcomes, Patient Education / Self-Care and tagged care management, medical care, participation in life, self-care, time, work on July 21, 2016 by Jennifer Christian. Where does working age end? Who is too old to work? I’ve been trying to draw more attention to the special healthcare needs of the working age population since they power the engine of the economy. The healthcare industry needs to expand its focus beyond symptoms and select treatments that rapidly restore the ability to function in this group — to help them recover faster and more completely, to keep their jobs and livelihoods, and avoid the negative consequences of prolonged worklessness for them and their family! Doctors and other healthcare professionals often don’t really THINK ENOUGH about the impact of their treatment regimens on working people’s lives outside the office. But as I advocate, I’ve begun pondering that definition: “working age”. It seems safe to use 18 as the low end of the range (even though kids younger than that do work, most of them are still in school). But what about the top end? At what age should we stop seeing work as the norm? Stop expecting anyone to work? Start thinking it’s silly to insist on working? What term should we use to describe those who have lived for a really long time but are still very active and working? What term should we use to describe people who are the exact same age but the press of years has made them too feeble to work anymore, even though they are “healthy”? We all know people in both of these categories. Simply calling them both old seems inaccurate. I found a thoughtful article from the World Health Organization (WHO) exploring how to define “old” or “elderly” — in Africa! Have you noticed how often we notice oddities about our own culture when we look outside it? That’s when we notice the automatic assumptions and blind spots we’ve been living with. I think you’ll enjoy reading the excerpts I’ve pasted below from the full WHO article. I have colored in red the parts I found most eye-opening. They are a breath of realistic and straight-spoken fresh air about how humans age. Bottom line as I see it: In developing societies where the administrative and legal fictions of retirement and pensions do not exist, the people tend to define old and elderly straightforwardly and on a case by case basis depending on the actual circumstances of humans as they accumulate years (and as younger generations come behind). Old age begins when one assumes the social role of an elder, when one withdraws from social roles either because it is time for someone younger to take over or because of decline in physical / mental capability. And finally, when it is no longer possible to actively contribute, one is definitely well into old age. By that reasoning, if you are still able to play the roles and carry the same load of a person a decade younger, you are not old yet. I still don’t know what to call you though. Or, more truthfully, I don’t know what to call myself. I am still in there pitching though I turn 70 years old this year. I did recently give up one of my roles to make room for a younger person who deserved her day in the sun. Didn’t want to hog it and hold her back. Most developed world countries have accepted the chronological age of 65 years as a definition of ‘elderly’ or older person, but like many westernized concepts, this does not adapt well to the situation in Africa. While this definition is somewhat arbitrary, it is many times associated with the age at which one can begin to receive pension benefits. Although there are commonly used definitions of old age, there is no general agreement on the age at which a person becomes old. The common use of a calendar age to mark the threshold of old age assumes equivalence with biological age, yet at the same time, it is generally accepted that these two are not necessarily synonymous. As far back as 1875, in Britain, the Friendly Societies Act, enacted the definition of old age as, “any age after 50”, yet pension schemes mostly used age 60 or 65 years for eligibility. (Roebuck, 1979). The UN has not adopted a standard criterion, but generally use 60+ years to refer to the older population (personal correspondence, 2001). The more traditional African definitions of an elder or ‘elderly’ person correlate with the chronological ages of 50 to 65 years, depending on the setting, the region and the country. ….. In addition, chronological or “official” definitions of ageing can differ widely from traditional or community definitions of when a person is older. Lacking an accepted and acceptable definition, in many instances the age at which a person became eligible for statutory and occupational retirement pensions has become the default definition. …. “The ageing process is of course a biological reality which has its own dynamic, largely beyond human control. However, it is also subject to the constructions by which each society makes sense of old age. In the developed world, chronological time plays a paramount role. The age of 60 or 65, roughly equivalent to retirement ages in most developed countries, is said to be the beginning of old age. When attention was drawn to older populations in many developing countries, the definition of old age many times followed the same path as that in more developed countries, that is, the government sets the definition by stating a retirement age. Considering that a majority of old persons in sub-Saharan Africa live in rural areas and work outside the formal sector, and thus expect no formal retirement or retirement benefits, this imported logic seems quite illogical. Further, when this definition is applied to regions where relative life expectancy is much lower and size of older populations is much smaller, the utility of this definition becomes even more limited. Study results published in 1980 provides a basis for a definition of old age in developing countries (Glascock, 1980). This international anthropological study was conducted in the late 1970’s and included multiple areas in Africa. Definitions fell into three main categories: 1) chronology; 2) change in social role (i.e. change in work patterns, adult status of children and menopause); and 3) change in capabilities (i.e. invalid status, senility and change in physical characteristics). Results from this cultural analysis of old age suggested that change in social role is the predominant means of defining old age. When the preferred definition was chronological, it was most often accompanied by an additional definition. …… If one considers the self-definition of old age, that is old people defining old age, as people enter older ages it seems their self-definitions of old age become decreasingly multifaceted and increasingly related to health status (Brubaker, 1975, Johnson, 1976 and Freund, 1997). This entry was posted in Articles, Publications, Research, Musings, Policy Issues and tagged aging, job loss, participation in life, work on July 6, 2016 by Jennifer Christian. Have you heard of RespectAbility? 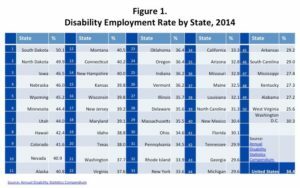 When I went to their website, I found a COOL CHART showing some HOT NUMBERS: the best and worst states for people with disabilities who want to work. • Guess which state has the highest employment rate for people with disabilities – 50.1%? Do you think it’s a blue or a red state? • Guess which state has the lowest rate – 25.6%? Is it blue or red? • Answer: Almost all of the best AND the worst states for people with disabilities with regard to employment are in the red zone of the USA. 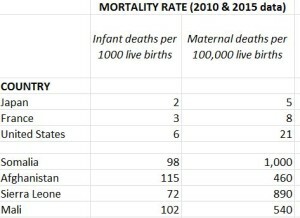 So, what else might be the reason for the differences between states? Hmmmmmmmm. Is it the underlying health of the state’s economy? I went to Mr. Google to find a ranked list of state economies. This list on Business Insider was the first one I found. Yay, here’s the answer, I thought (for a moment). The WORST state for people with disabilities is the LAST state in the ranking – the state with the weakest economy over all (West Virginia). 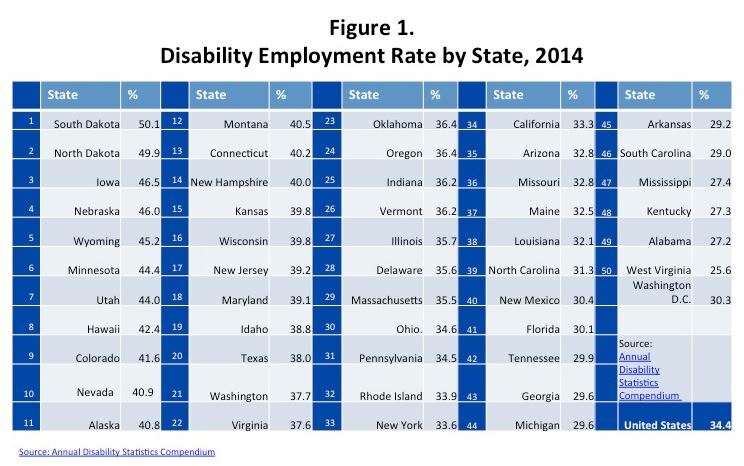 BUT then I noticed that two other states among the bottom 10 of Business Insider’s list of state economies are in RespectAbility’s the TOP FIVE for employment of people with disabilities: North Dakota and Wyoming. And at the other end, of the 10 states that Business Insider ranked most economically healthy, only 1 was also in RespectAbility’s top group for people with disabilities (South Dakota). I started to wonder whether Business Insider’s list was the “right” one, and found three other lists, here, here, and here — all of which purported to describe the health of state economies. Each one has a VERY DIFFERENT RANKING of the states!! The difference seems to be the method they used: the underlying data sources and the formula used to calculate the results. So I said uncle. As an economic babe-in-the-woods who is unable to sort through this stuff, I have given up my extremely short amateur quest to understand WHY some states are better places to be if you have a disability and want to work! For now, it is what it is, to use the jargon of today. 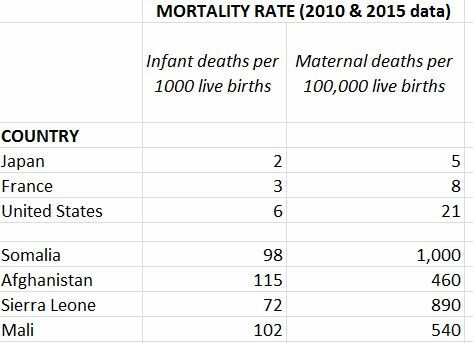 CLICK ON the table from RespectAbility pasted below and check out the numbers. Then go to the full article on the RespectAbility website to read their analysis of why the numbers look the way they do – and what it all means. And while you’re there, RespectAbility has also asked the current candidates for President of the USA to answer questions about their position on people with disabilities. Their answers were NOT all the same! This entry was posted in Causes of Poor Outcomes, People, Organizations & Websites, Policy Issues, Uncategorized and tagged acquired disability, disability, job loss, work, work disability on May 11, 2016 by Jennifer Christian. Tier 1: Delivering a desired health status — Avoiding death; optimizing health or extent of recovery. Tier 2: Minimizing the time it takes to restore the normal rhythm of everyday life — the cycle time required to produce a return to full participation in life (or best attainable level). 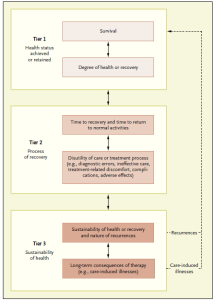 Tier 3: Sustaining health or recovery, minimizing recurrences and iatrogenic (care-induced) illnesses and consequences. Porter’s free article appeared in the December 23, 2010 issue of the New England Journal of Medicine. In his comments on Tier 2, Porter said: “Cycle time is a critical outcome for patients — not a secondary process measure, as some believe.” I have focused most of my professional energy for the last couple of decades on shortening cycle time — because it clearly produces better overall life outcomes. I hoped Porter’s article would catalyze a lot of discussion and much more attention to Tier 2 — but not much luck so far. Personally, I believe that the purpose of being alive is to live a fully human life. From that perspective, the most VALUABLE healthcare services are those that minimize the impact of illness or injury on the rhythm of everyday life. I want all healthcare professionals to START here: Our FUNDAMENTAL purpose is to avert premature death, relieve fear and suffering, and to enhance, preserve,or restore as quickly as possible every patient’s ability to participate in the specific activities that make life worth living — which for many includes productive engagement / work. We are a social species. We have an innate drive to be useful in some way, to have a role to fulfill. We are happier when we have a clear purpose in life. Those of us in the middle years of the human lifespan are DESIGNED to work — to hold up our end and contribute to the well-being of our family, clan, community or nation. The well-being of our country, and even more broadly, the survival of our species depends on maintaining the right balance between dependents and contributors. This entry was posted in Articles, Publications, Research, People, Organizations & Websites and tagged functional restoratoin, participation in life, time, value of healthcare, work on July 9, 2015 by Jennifer Christian. Why aren’t we saying and doing THESE THINGS about the ADA? I’ve been listening to the prevailing conversation about the Americans with Disabilities Act, as amended (ADA), in workers’ comp and disability benefits circles. Most often it has a negative tone: the ADA imposes obligations and creates complicated legal dances that can get us in trouble unless we do things exactly right. I almost never hear ANYONE in these industries (other than disability rights advocates) talking about what we can do to FULFILL the social purposes for which that law was created! This entry was posted in Policy Issues, Uncategorized and tagged acquired disability, books, disability, job loss, outcome measures, work, work disability, worklessness on June 5, 2015 by Jennifer Christian.